Casa Ramos in Mount Shasta, House of Ramos, is a family owned restaurant serving Mexican food. The food at Casa Ramos is constantly good, service is right on and the food is well priced. Casa Ramos is family friendly with options for vegans and vegetarians. Casa Ramos is one of our favorite places for birthdays and family dinners. The have a full bar with a selection of tequilas and Mexican beers. Weather permitting outdoor seating. Bistro No. 107 on the corner of Chestnut and S. Mt. Shasta Blvd. serves soups, salads and a variety of gourmet burgers including beef, halibut and house-made veggie patty. They have a daily special board and a good selection of micro-brews and wine. Weather permitting there is patio seating. Phuket (pronounce ‘Poo-ket’) Cafe serving Thai Cuisine is located at 1328 S. Mt. Shasta Blvd. They are a family owned and operated cafe. Eat in or order take out. They are open Tuesday thru Sunday. They serve lunch and dinner every day, but only dinner on Tuesday. They are closed on Mondays. The space is decorated with Thai art and has an place for burning incenses offering of oranges and a large laughing Buddha. The space is large and can be cool in the winter. Plan ahead and take an extra layer. The Phuket Cafe has a lot of vegetarian options and they are family friendly. Seven Suns Coffee & Cafe is a favorite spot for locals and travelers alike. The coffee is good. The Breakfast Burrito cab be made for vegans. Indoor and outside seating. The are open from 6am to 4pm 7 days a week at from 1101 S. Mt. Shasta Blvd. 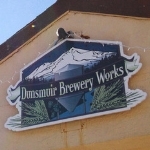 Dunsmuir Brewery Works is a family owned and operated micro-brew pub serving very tasty foods with seasonal ale style brews in the charming historic district of downtown Dunsmuir. This family friendly eatery is open 7 days a week in the summer months. Enjoy their patio under market umbrellas. Also, read my interview with owners David Clarno and Aaron Greener. The Wheelhouse on Sac. Ave. is a family friendly restaurant serving breakfast all day with plenty of options for vegetarians, vegans and gluten free eaters. They have the best hand cut French fries in the county. The Dough Hook opened its doors in 2018 next door to The Wheelhouse on Sac. Ave. in Dunsmuir. They offer French style breads, cupcakes, cakes, pastries and Challah bread. They make custom cakes for weddings, birthdays and other special events. El Zaguan - Good street style Mexican food from a family owned restaurant in Yreka and Food Truck in Weed. I recommend any of the tacos! The Truck is parked in to the west of Grocery Outlet Store and across from the Pilot Station in South Weed. The Hi-Lo Cafe in Weed is a family owned, family friendly restaurant. They serve breakfast all day. The Hi-Lo is located at 88 S Weed Blvd in Central Weed. They are open seven days a week from 6 am to 10 pm. Jefferson's RoadHouse has World Famous Appetizers and desserts and well as a lunch and dinner menu that has something for everyone. Located at 1281 S Main St. in Yreka. They are open seven days a week. The Klamath Basin Brewing Co. and Creamery Brewpub and Grill is a family friendly eatery located in downtown K-Falls. The menu has something for everyone and micro-brews. They are open 7 days a week. Their large patio is open weather permitting. They have heaters, too. Cantina Del Sol is located on 1175 Solano Ave. in Albany. The Cantina serves Mexican American Comfort food made in their kitchen with locally-sourced and authentic Mexican ingredients. They have large selection of tequlia, Mezcal and local brews. They are open 7 days a week with Taco Tuesday, Thirsty Thursday and Sunday Brunch with vegan and vegetarian options all served in colorful Mexican decor. Doña Tomás is a popular eatery in Oakland’s Temescal District at 5004 Telegraph Ave. serving classic Mexican dishes. Doña Tomás uses as many sustainably grown and organic produce and meats as is possible sourced in the Bay Area. The restaurant is lively with patio seating - weather permitting. You can tell the food at Doña Tomás is made with respect for the ingredients. My friend Jan and I had Sunday Brunch there and we left feeling happy and satisfied. They offer brews from rotating taps and Mexican Coffee. They are closed on Mondays and check website for lunch and dinner times. Tiramisu from the Sonoma Market is located at 500 W. Napa St. Sonoma. The Tiramisu is a rich, creamy chocolatey coffee flavored treat. They have been serving the Sonoma Valley for more than 50 years. The market has a reputation for having high-quality products, fresh farm-to-market produce, local and imported wines, and artisanal cheeses. 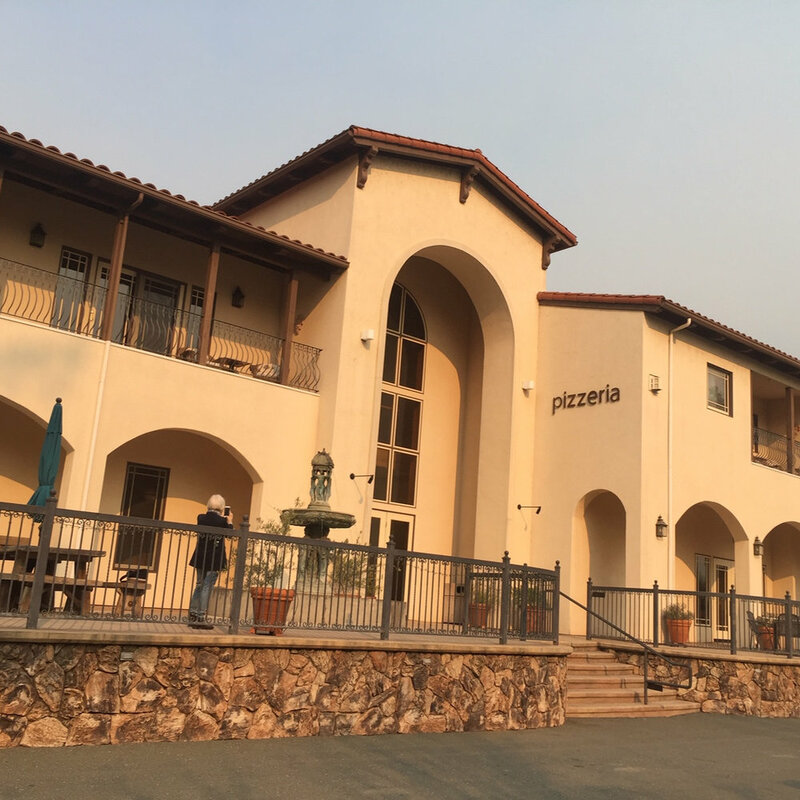 Piazza de Campovida islocated at the south end of the downtown area of Hopland at 13441 South Highway 101 in a large Mediterranean style building that houses a hotel, bar and dinning room. We ate pizza and salad in the bar with a IPA. Where they serve craft brews in mason jars. Pizza’s are traditional Napolitano style pizza cooked in a wood fired brick oven. They have gluten free and vegetarian options. Salads feature local produce. Támal in Fairfax is located at 23 Broadway Blvd across from the parking lot by the theater. Támal’s tapas-style menu include foods inspired by “Regional Mexican cuisine,” Mexican craft cocktails and local ales. They have a warm contemporary vibe with a mixture of wood, metal and Mexican artworks. They are open for dinner at 5pm Wednesday thru Sunday. Walk-ins are welcome or call for reservations. Cafe Verde in located at 502 Tamalpais Dr, in Corte Madera, It’s a homey cafe with a large outdoor patio. The Cafe Verde is a local casual spot with a European vibe serving Mediterranean style foods. They are open 7 days a week from 8:00 am - 9:00 pm serving breakfast lunch and dinner with a Happy Hour from 4-6 pm.